Latest News — Cloudpoint Geographics Inc. Completing a Township-wide Sign Inventory for the Monticello Township Highway Department! This week Joe and Tyler ventured to Monticello, IL for a township-wide SignOps implementation and data collection. They were able to inventory all of the Monticello Township Highway Department (MTHD) signs both in the field and in their shop in just 2 days! This allows for a turnkey sign inventory solution for the MTHD. No longer are they required to mark up paper maps,only to then send their notes to be edited on their maps on someone else's timeline. They can now easily swap out a sign that has failed inspection (let's say for instance a right curve ahead sign, W1-2R, has been shot). All they have to do is pull a new sign out of the shop, head to the sign that needs replaced, scan the barcode on the back, select "replace", and then scan the new sign. It's really that simple! This not only speeds the process along, it creates a maintenance record for the completed work as well. In addition to being home to the Piatt County Courthouse, Monticello is home to the 1994 State of Illinois Airport of the year, and the best guard cat in Central Illinois, Shop Cat! Want to find out how your township or municipality can benefit from SignOps? Check out our SignOps YouTube channel for helping hints and tutorials, or visit our SignOps web page for more information! SignOps: There's only one way! What a great time at WLIA! 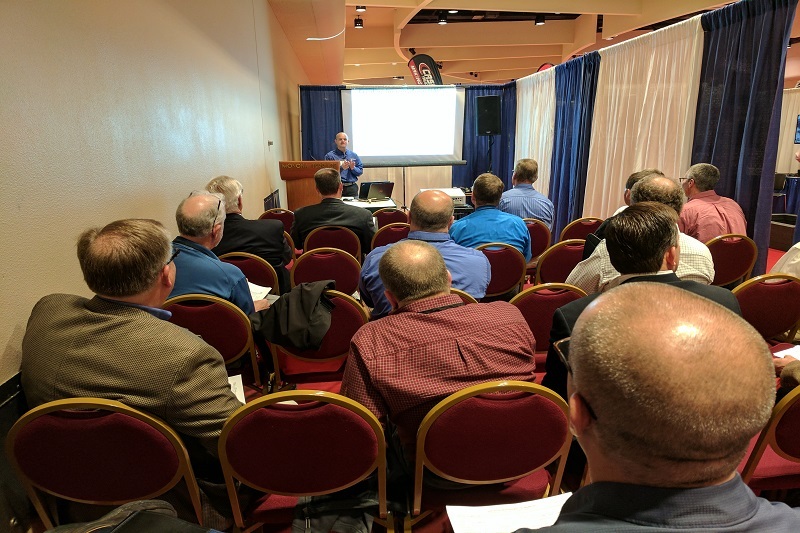 Last week Jon and Joe headed north to Elkhart Lake, WI for the annual Wisconsin Land Information Association (WLIA) Conference. It was a great event and we were able to connect with current clients and new county officials. We had a wonderful time talking about a variety of projects ranging from migrating to the parcel fabric to completing county-wide inventories. Congratulations to everyone who won a Cloudpoint Titleist or camouflage hat by showing off your putting skills at our booth. We've said it before, and we'll say it again, "WLIA is one of the best conferences that we go to each year!" That said, we look forward to seeing you at future WLIA regional events and at the 2019 annual conference! Waushara County Land Information Officer Zach Newton won a camo Cloudpoint hat by going two for two in our putting competition! Looking good Zach! Adventures in Iowa: Spreading the word about Cloudpoint! One great thing about working at Cloudpoint is the wide variety of clients we have and the array of projects and services that we provide. Although we're pretty well known in Illinois and Wisconsin, some of our other Midwest brethren are less familiar with the company. 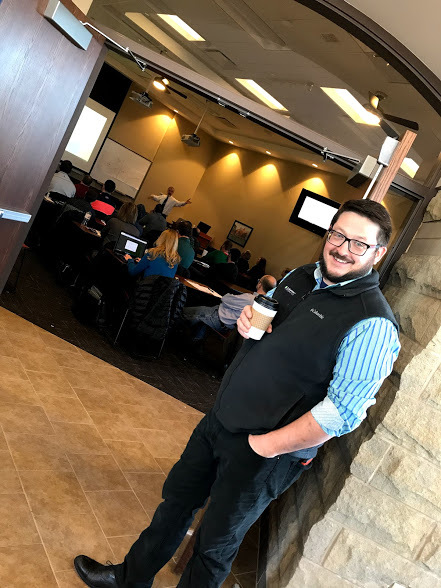 This past Wednesday, Cloudpoint's Joe Christian started to change all that by hitting the rural roads of Western Illinois and Eastern Iowa to spread the good word about GIS and Cloudpoint. 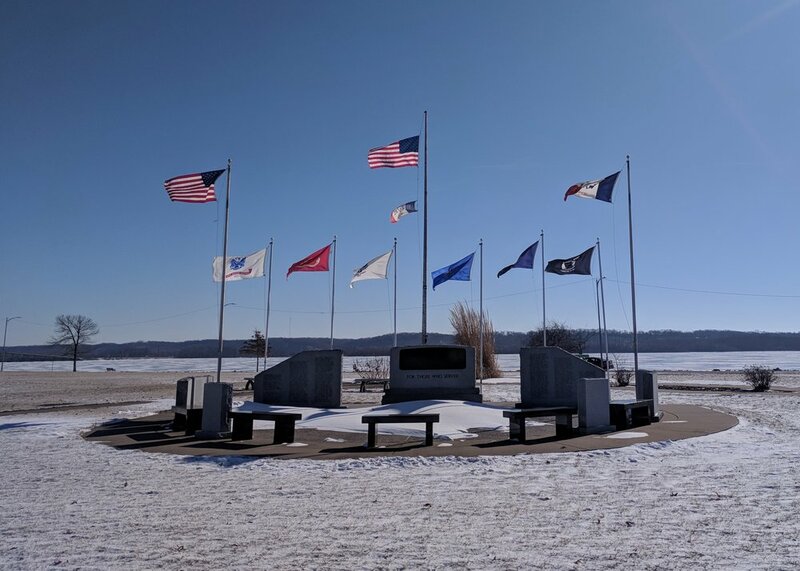 Veteran's Memorial at Riverview Park overlooking the frozen Mississippi River in Ft. Madison, Iowa. With stops in Knoxville, IL; Galesburg, IL; Monmouth, IL; Burlington, IA; Ft. Madison, IA; Keokuk, IA; Hamilton, IL; Carthage, IL; Macomb, IL; and Bushnell, IL, Joe covered over 300 miles and met a variety of professionals including: Public Works Directors, Public Works staff, GIS Coordinators, Cemetery Sextons, County Engineers, and County Highway Departments. 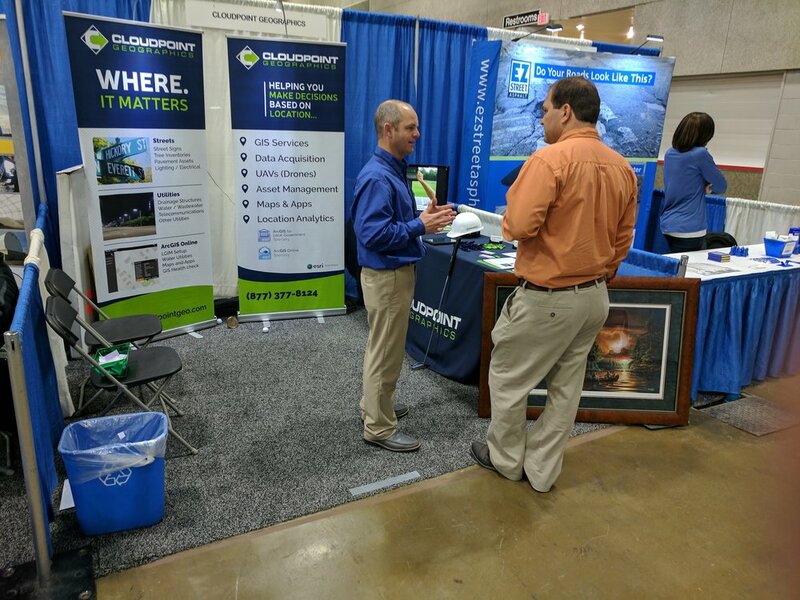 Whether he was talking about our SignOps sign inventory program, or he was talking about overhauling existing utility infrastructure maps, Joe was able to connect and impart the importance of updating maps with GIS with everyone he met. Would you like to learn more about all of the services and solutions that Cloudpoint can provide? If so, please follow the link below to signup for our Technical Blog and Quarterly Newsletter below. Link to sign up for our Technical Blog and Quarterly Newsletter. Bloomington's sewer database gets overhauled! 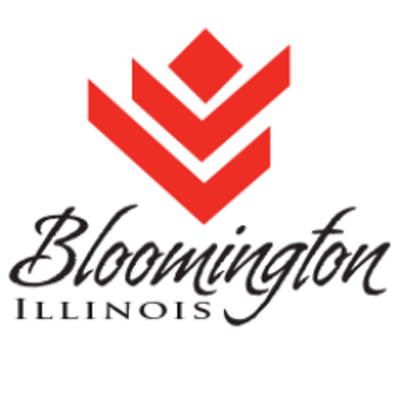 The City of Bloomington, IL has contracted Cloudpoint Geographics to assist in updating their sewer network data. This project includes migrating their sewer network data into Esri's Local Government Information Model, creating features for missing assets, assigning new feature ID’s, and improving workflows for 3rd party software integration within their GIS environment. The City of Bloomington, IL continues to improve upon their already robust GIS. This time by contracting Cloudpoint Geographics to overhaul their sewer database. Once the database has been quality checked, Bloomington will have a much better view of their features in the real world. This will help with planning future work, improving efficiency, and speeding up work in the field. To learn more about our GIS database management, contact us at 877-377-8124. This has been quite the eventful year at Cloudpoint Geographics. We've been fortunate enough to have completed several projects ranging from a SignOps sign inventory for Macon County, IL, to flying a proposed drag racing strip south of Eau Claire, WI. We also said farewell to our friend and colleague Paul Stephenson as he headed west to Nevada. All in all, it was a great year full of great successes. We've put together the gallery of pictures below as a recap of the great events that we attended, and the projects that we completed in 2017. We can't wait to see what 2018 has in store, and we look forward to bringing more great GIS solutions to the masses! Happy New Year from the Cloudpoint team! Up, Up, and Away! Another Cloudpoint Team Member Earns His Wings! Cloudpoint would like to congratulate team member Tyler Severson on passing his FAA UAV Drone Pilot exam! 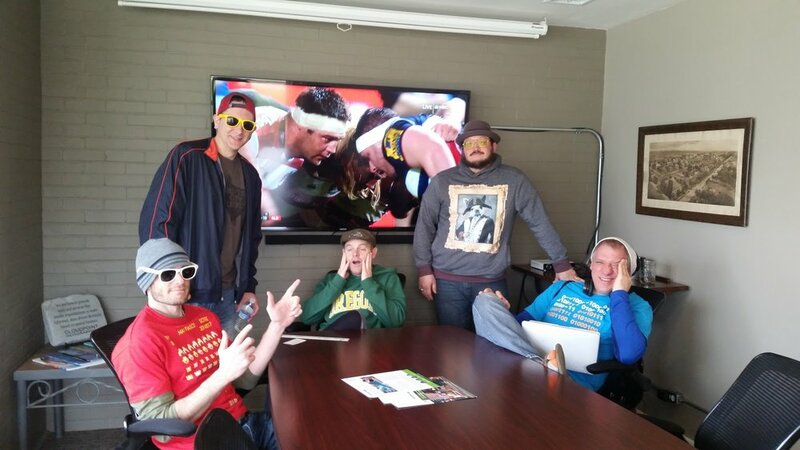 Tyler (Ty) Severson has been an important member of the Cloudpoint team for a little over 2 years. He works on a wide variety of projects including culvert inventories, sign inventories, parcel mapping, and more. Well now you can add being a UAV pilot to the list. Yesterday Ty passed his Federal Aviation Association UAV pilot exam, which will allow him to complete flights for upcoming projects. Ty has been studying hard for the exam as he continues his education at Illinois Central College, and we are very proud to see his hard work pay off. With the addition of another pilot, Cloudpoint has once again positioned itself as the best choice for geospatial services! This is in-fact on a different day, he just really-really likes that flannel shirt! As the Summer projects start to slow down, Cloudpoint's conference season is heating up. 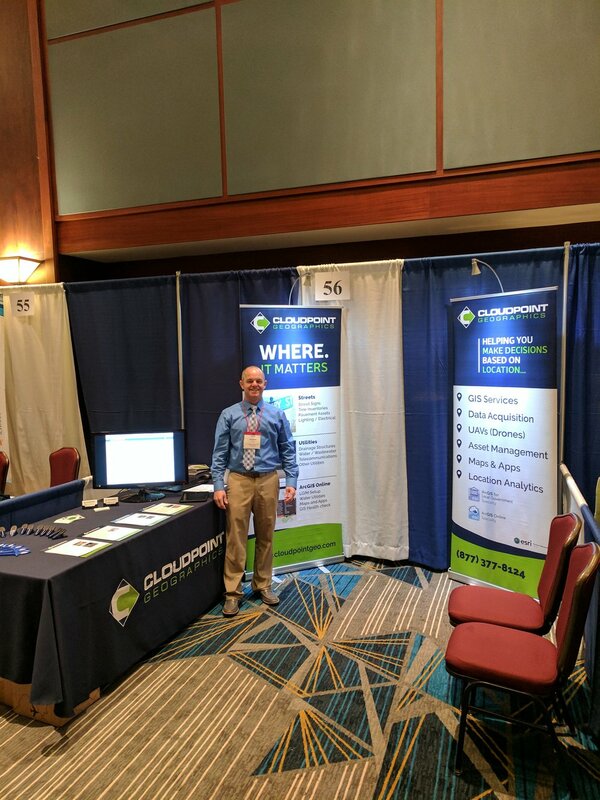 In the past month our team has been to the Illinois GIS Association (ILGISA) conference in Normal, IL; the Illinois Association of County Engineers (IACE) conference in Moline, IL; the Traffic and Engineering Safety (TES) conference in Champaign, IL; and the Esri Wisconsin User Group (EWUG) conference at Lambeau Field in Green Bay, WI. Next week Jonathan and Joe will be attending the Illinois Public Safety Telecommunications Association conference in Springfield, IL, and in two weeks they'll be at the Illinois Association of County Officials conference in Peoria, IL. Needless to say, we've been busy, but what value are we bringing the masses at all these conferences? The value of GIS, that's what! As an Esri business partner with specialty designations in ArcGIS Online and Local Government, we cover a wide range of professionals with our services and solutions. That means we discuss our parcel mapping, inventorying assets, survey grade GPS data collection, drone mapping capabilities, and much more. One of our favorite aspects of work here at Cloudpoint is talking with real people about how they can get more accomplished with our solutions. Please enjoy the collection of pictures above from the conferences so far, and don't hesitate to reach out to us if we can ever assist your organization in completing its goals. You can learn more at www.cloudpointgeo.com or call 877-377-8124. Esri has their mammoth User's Conference every year in San Diego. See Joe's review of that. In an attempt to accommodate specific industries, they also hosts a few much smaller events across the country throughout the year. This year the gas, electric & telecom conference, named GeoConX (pronounced geo-connects) was hosted in Chicago. With our client base and perfectly aligned conference in our backyard. both Micah and Paul attended. There were over 700 attenders learning about GIS and the Esri Platform. Why is this crooked Micah? overtime we see it we are more and more impressed with the capabilities and tools available to us. There are now several tools available for you to install and configure ArcGIS Enterprise. Esri has taken a few years to build the next rendition of the geometric network and they plan on it being around for 15 years. Beautiful but Also site of the 1968 DNC that ended in riots. There should be much thought given to how you will implement your GIS. Paul had never seen The Bean. This is the obligatory Selfie. We were happy to attend at the behalf of our gas, electric and telecommunication clients. There is much to look forward to in the upcoming technology. Notably an entirely new Utility Networking system built to last, Attribute Validation Rules, Survey123 working with Collector & Workforce, ArcGIS Enterprise Builder, Web-based Dashboards, Hexagon Bins ... Well lets just say it was all notable. Worried about crop health? Cloudpoint Aerial Services has you covered! Cloudpoint Aerial Services is excited to introduce new imagery capabilities! We've recently added a drone to our growing fleet, but what makes this drone special is the camera that it carries. The Normalized Difference Vegetation Index (NDVI) is a way to collect data regarding plant health and live vegetation by calculating the amount of visible and near-infrared light that is reflected off of a each plant. By doing this, we can now show which plants are healthier than others. I could explain it all day, but it's probably easier to just show you some imagery. Here you can see an example of NDVI imagery. Although you can adjust the colors to your liking, healthier plants show up as various shades of green, and the red hues reflect plants that are struggling. With this new feature, we have expanded the geospatial services that we offer. We already have GIS solutions for agriculture land assessment, and now we can help farmers increase their yields with the NDVI. Are you a farmer who's looking to take your crop management to the next level? Contact us today at 877-377-8124 or cloudpointgeo.com/drones to learn more. Also, a special thanks to Mike & Eric Hoeft and Stewart Family Farms who were kind enough to let us fly their test plots. Is your Address Data ready for NG9-1-1? Our local government experience in building GIS solutions on the Esri platform helps us offer value-added services to agencies needing a professional solution in a timely manner. Don't wait for Next Generation 9-1-1 to come to you, make the effort to be prepared. For more information on pricing contact us at 877-377-8124 or submit below. Tell us what you're you looking for? Let's schedule a time to talk Not interested right now, but maybe later No thanks, our address data is in good shape.